My book on genetic genealogy is finally in print, and it feels very strange promoting yourself; however, every blogger has different followers, and as this is the first book which covers so many aspects of genetic genealogy for nearly a decade, forgive me for being shameless. I decided to write this book after not being able to convince those who are more knowledgeable than I to do so. I needed a more current source for members of my audiences so I could reduce the time in answering basic questions repeatedly. Not that I mind answering, but it became an issue of time. 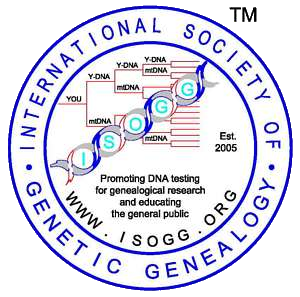 Genetic Genealogy: The Basics and Beyond provides genealogists, both budding and experienced, with the knowledge and confidence to use DNA testing for their family research. 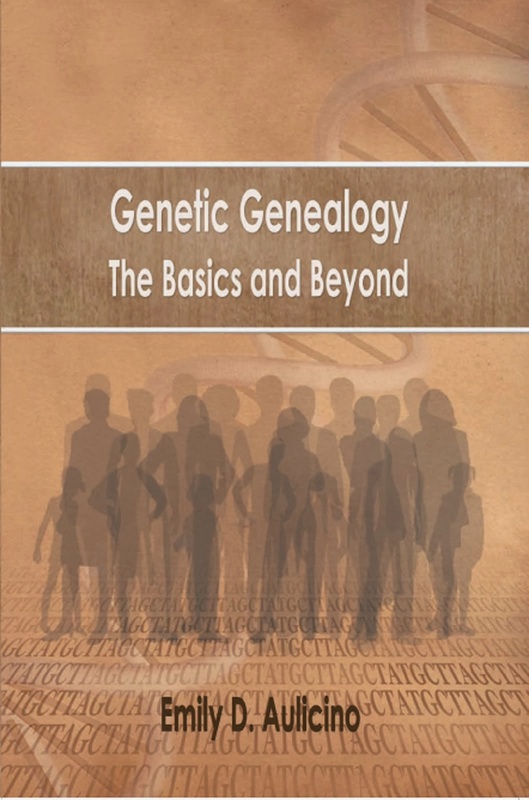 The book guides genealogists through the introductory level of understanding various tests to a more advance level of determining what DNA segments came from which ancestor. Genetic Genealogy explains how DNA testing helps when written records stop and discusses how testing can prove or disprove oral family history. The book describes which tests can help adoptees find their biological families and mentions a website that offers free assistance for testing and locating adoption information. Genetic Genealogy helps you understand why you resemble your relatives and explains how DNA testing can connect you with cousins you never knew existed. Steps for encouraging potential cousins to test are outlined. The more adventurous can find guidelines for becoming a project administrator, a genetic genealogy speaker or a facilitator for their genealogical society’s DNA interest group. Genetic Genealogy: The Basics and Beyond will help both the experienced and the fledgling researchers become genetic genealogists able to use DNA testing to resolve their genealogical roadblocks. My book can be ordered through these online publishers: AuthorHouse, Amazon and Barnes and Noble or from your local bookstore upon request. It is available in trade paperback as well as an e-book for both the Kindle and Nook. "Writing a single volume overview of DNA testing is growing more difficult year on year as the field becomes ever more exciting and complicated. Emily's book is a comprehensive description of the key genealogical uses of DNA testing as they existed in 2013. 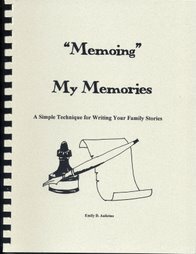 Leavened with examples and experiences, it contains loads of practical advice, particularly on the newer tests like FTDNA's Family Finder." 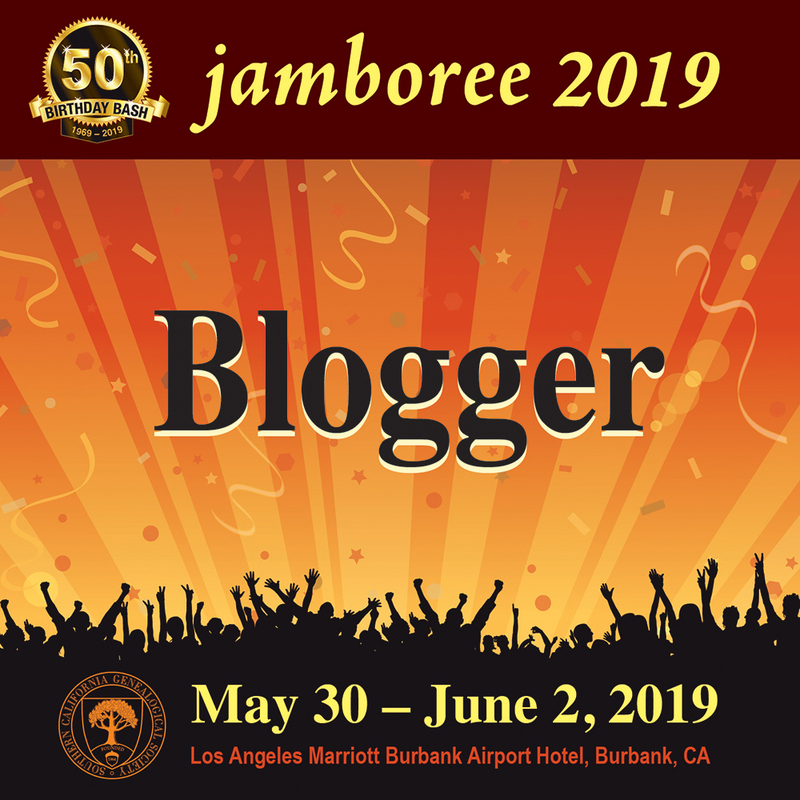 AND...once again, I thank the many people who did help edit and contribute information for the good of the whole genetic genealogy community. I dearly hope that you will find some helpful information within the pages and that all of you will continue to share your knowledge of how DNA testing helps genealogy. A few months ago Family Tree DNA offered $10 coupon to any tester who had not uploaded their Gedcom. This coupon is good for any test over $49 and there is no expiration date. I previously wrote about this and it appears that many people did upload. However, not near enough. I recently went through all my pages to see who had a Gedcom. I found 152 gedcoms uploaded ourof 652 matches. I found at least one person with themselves and their parents uploaded; nothing more. I found another person with 3-4 generations, but only gave names; not dates or places. Not a great showing given that many people are genealogists. I was surprised that I had many matches whose lineage was totally outside of the U.S. Their generations were extensive. I’m not inclined to share my lineages just anywhere. I have worked for too many years (read that: decades) and have extensive sources for my lineage. 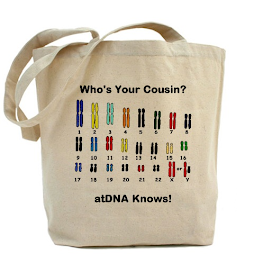 However, only the matches you have at Family Tree DNA can see your Gedcom. It’s not like posting it to the world. So why should you upload your Gedcom to FTDNA? I went through those 152 Gedcoms and found common ancestors for five of my matches. Yes, not a huge number, but it’s not only five more than what I had, but we can now dialogue on who matches them where they match me as well as look at each of our downloaded DNA segments to determine if others may be connected on the same line. Of course, having up to 12 generations (although only 9 are posted on FTDNA) and knowing as many descendants of your direct line ancestors makes locating common ancestors much easier. Excluding the matches with cousins that I personally know and those cousins I previously found in other ways, the following are those discovered by checking their Gedcom only. Predicted cousinship is 5th cousin to remote. This 5th cousin 1x removed relates to me through two different lines of my pedigree chart. It is not unusual in colonial times that families intermarried. Such is the case here. Of course, the advantage is that the descendants have more DNA that normal so it is easier to match people. The predicted match may be more recent than it actually is. This is a major reason to have your pedigree charts as far back as possible and as extensive as can be for the descendants of your ancestors. Line 1: Philip E. Williams, born ca 1792 and died in Jackson County, Alabama married Catherine Miller, daughter of Jacob Miller and Sarah. Line 2: Adam Sherrill, born between 1698 and 1701 in probably Cecil County, Maryland and died between March 1772 and May 1774. He married Elizabeth Unknown. Adam’s parents were William Sherrill and Margaret. My 6th cousin along my Canterbury line is probably quite happy that I viewed all these pedigree charts as I was able to give her 4 more generations along that line. Predicted cousinship is 3rd to 5th cousin. And oh, what a lucky 6th cousin 1x removed on my Bourn line. I gave her 3 more generations. Although listed as a 3-5th cousin we are actually 6th cousins 1x removed as we match a few times on these lines. As this connection to my cousin crosses lines a few times and we each have several connections, the following graph may clarify the connection. 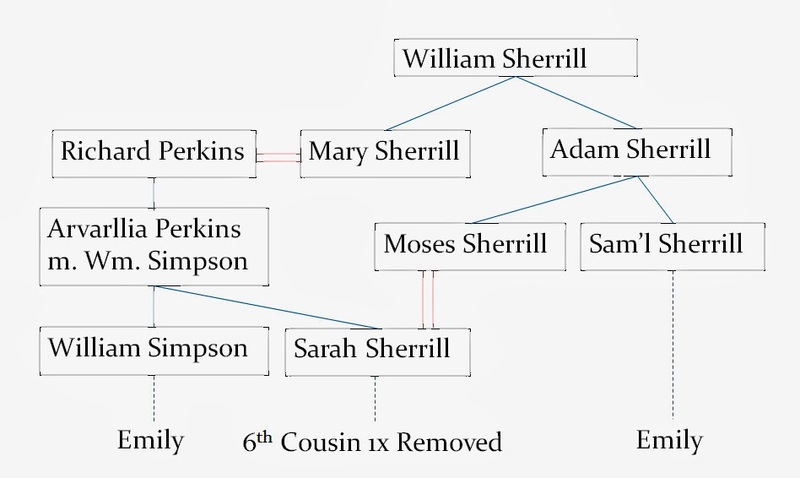 I descend from Arvarilla’s son William and my cousin from her daughter Sarah who married Moses Sherrill, son of Adam. The double lines indicate marriage. My match’s ancestor Jacob G. Lycan(s) is the father-in-law of my 4th great grand uncle. At this point in time the Lycan(s) surname is indirectly related to me, but finding this Gedcom added more details to my chart on the spouse’s side. This makes me wonder if there is not a marriage to someone in my direct line that I do not know about yet. I do know the surname was used as a middle name for many relatives in my Canterbury line. There has to be a connection somewhere. As more people upload their Gedcoms more common ancestors will be found. However, those Gedcoms must be as detailed as possible for the best results. As genealogists, it does little good to call our work done; we must continue filling in the gaps. Although more and more records are becoming available on the internet, a good genealogist knows that is not the only resource as most records are still found in the courthouses and various other depositories. Let’s make this year a great success for genetic genealogy and finding our common ancestors! Within minutes of Family Tree DNA releasing the X-chromosome information to our Family Finder webpages, I was able to determine which ancestor gave Rebecca, my second cousin, and I a portion of our X-chromosome. How did I find the most recent common ancestor who contributed these segments so quickly? First of all, I knew this cousin was on my mother’s all-female line. 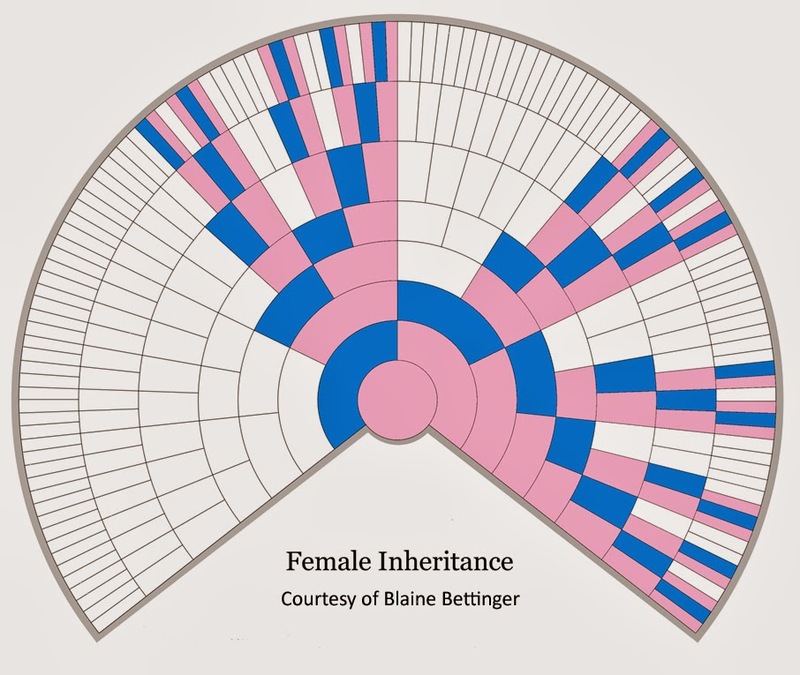 BUT, more importantly, I used Blaine Bettinger’s female inheritance fan chart for the X-chromosome to determine which ancestors could have contributed this portion of our X-chromosome to each of us. This fan chart for women is different than for men so download each copy. The women's if found here. The men's can be found at this website. If you prefer a list of ahnentafel numbers for your ancestors who provided your X-chromosome DNA see this site for Ann Turner's list. I make an ahnentafel chart and omit all but the numbers in Ann's list. This is forwarded to my matches for their convenience. Note the pink and blue areas for the female inheritance in the chart below. These are the only ancestors who could have contributed to any portion of a female’s X-chromosome. 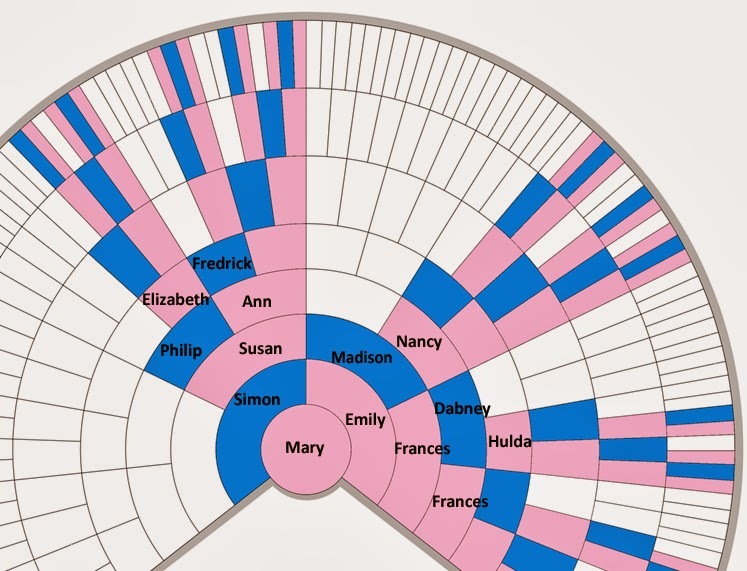 Like any pedigree chart, you enter the names of your ancestors in the respective places. I have completed one for quick reference. For this comparison, I plotted my lineage on the fan chart as seen in the expanded portion of the chart below. As I know Rebecca is on my mother's line, I focused only on that area. I received my X-chromosome from my mother Beverly who received it from her mother Emily. Emily, my grandmother, received one X-chromosome from her father Lowry and one form her mother Mary. 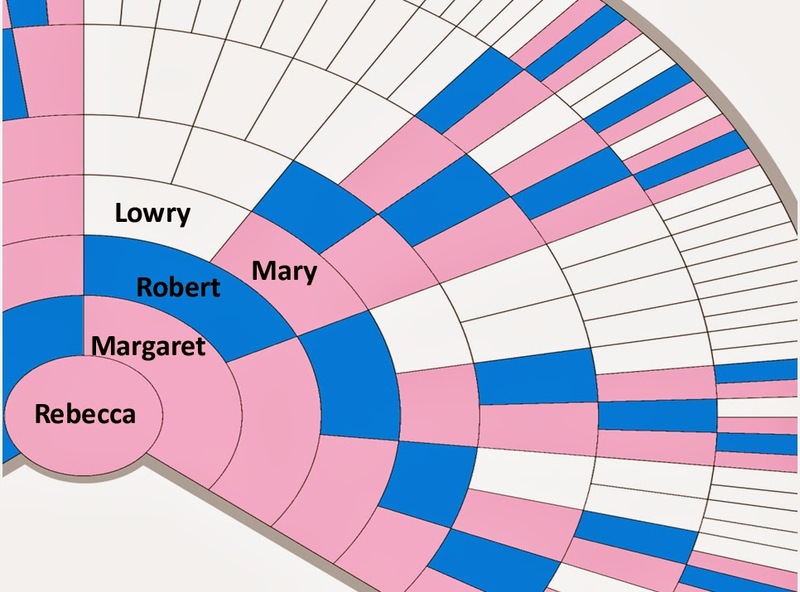 SO, which X-chromosome provided the portion I received that matches Rebecca…Lowry or Mary’s? To answer that question, I plotted Rebecca’s lineage as below. As there are two segments that Rebecca and I share and we only have Mary as a common ancestor, both segments came through her. However, without additional matches along Mary’s X-chromosome inheritance lines, we cannot be certain which of Mary’s ancestors contributed. 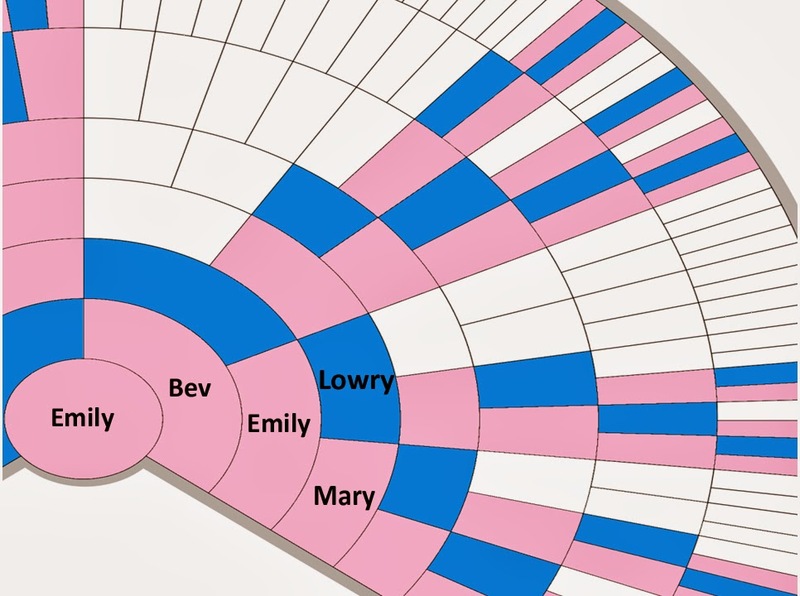 It is possible that each of the two segments inherited by Rebecca and Emily from Mary were from two of her ancestors, but there is no guarantee these segments are intact as the two X-chromosome women receive can recombine (mix) like other autosomal DNA. Finding others who match Rebecca and Emily in this area may provide clues as to which ancestors gave this portion of their X-chromosome to Mary since the other matches could relate farther back in generations. Family Tree DNA has provided genetic genealogists with a new toy for the New Year! Thank you, FTDNA. NOTE: Any success story is something to celebrate. Share your DNA successes here by emailing me. New to DNA testing for genealogy? Confused by the various tests and how they can help? The following list of Webinars were received today from Family Tree DNA. Attend them all! On January 2, 2014, Family Tree DNA launched an exciting update for Family Finder: X chromosome matches! This webinar will provide a brief overview of the new tools on the Matches and Chromosome Browser pages for viewing and analyzing your X chromosome match information. An information-packed webinar focusing on how to read and understand your Family Finder results. Learn about autosomal & X DNA inheritance, how Family Finder determines your relationship with your matches, how to use the Chromosome Browser, and much more! This advanced webinar goes beyond the Family Tree DNA Results Explained webinar series, providing more in-depth detail about the genetics and usage of Y-DNA testing. We will cover the following topics: NIST standards, compound markers, palindromic & multi-copy markers, genetic distance models, modal values & triangulation, micro-alleles, recurrent SNPs & SNP discovery projects. This FREE Online Seminar will help you learn the basics about Family Tree DNA's Y-DNA, mtDNA and Family Finder (autosomal DNA) tests. Elise explains what each of these tests can tell you about your ancestry and how to decide which test to order based on your personal interests and goals. She shows the basics of personal myFTDNA account where all of your results are reported as well as example results from each test. Elise will also gives a brief overview of our group projects and other resources available at Family Tree DNA. In this information-packed webinar, Elise focuses on how to read and understand your mtDNA results. Learn where to find your mtDNA results in your personal myFTDNA account, how to read your mtDNA Results page and what the results mean, how to analyze your mtDNA matches, what your mtDNA haplogroup means and much more. She also provides tips for making the most of your Family Tree DNA experience. What a New Year’s Celebration! The long-awaited X-Chromosome matching has arrived at Family Tree DNA and is now fully integrated it into Family Finder matching! But what is the X-Chromosome and how is it different? The X-Chromosome is one of the chromosomes that determine gender. A female has two X-chromosomes (one from mom and one from dad). Males have one X-chromosome from mom as he receives the Y-chromosome from dad. The X-chromosome inherited from a mother acts like autosomal DNA in that it goes through recombination and is passed to all of a mother’s children. A father passes a copy of his X-chromosome only to his daughters and it does not go through recombination. Since the X-chromosome has a unique inheritance pattern, it contains genetic material from some, but not all of a person’s ancestors. The DNA from the X-chromosome is informative about both recent and deep ancestry. If you prefer a list of which ancestors could have contributed your X-Chromosome data, create an ahnentafel chart from your genealogy software and omit any numbered ancestors except those in the following chart. The following numbers are the ancestors in your ahnentafel chart that have contributed to your X-Chromosome. Share the an ahnentafel chart you created for your X-Chromosome with your X-matches to help focus on finding the common ancestor. Links for the X-Chromosome have been added to the various Family Finder pages, so navigating the pages are basically the same for locating any of your matches information. Use the pull-down menu under Family Finder and click on Matches. On the Family Finder Matches page, there is a filter to show only X-Matches under the Relations drop-down menu. Matches are then added to the Compare in Chromosome Browser list. By clicking on the Compare arrow, you could go right to the Chromosome Browser. You can also go right to the Chromosome Browser from the Family Finder drop-down menu to view your X-chromosome matches. The Chromosome Browser allows you to filter the match list by X-Matches. Under the drop-down menu Filter Matches By, select the X-Matches. When you scroll down to the X at the bottom, we see that X-Matching is displayed for the first two but not the third. The X-Chromosome matches have also been added to the Advance Matching section. Select Advanced Matching from the Family Finder drop-down menu. An X-Chromosome link has been added here as well. Now, our autosomal results are complete! Happy Dance! Happy Dance! All the matches of WE!